Are you new to Medicare? 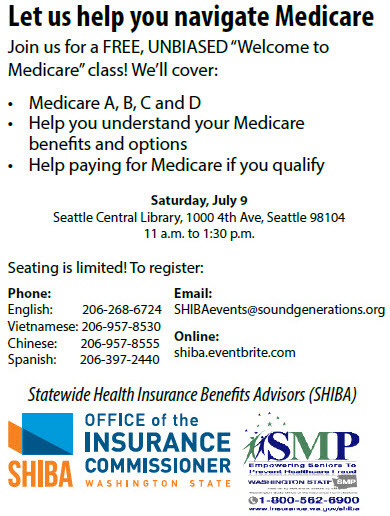 The Office of the Insurance Commissioner�s Statewide Health Insurance Benefits Advisors (SHIBA) will be at the Seattle Central Library from 11 a.m. to 1:30 p.m. on Saturday, July 9. Find registration and parking information for this event. � Find out more events on the SHIBA calendar. � Read more about SHIBA and how it can help you. 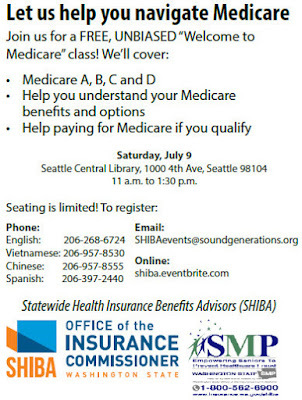 � Do you have Medicare questions? Call 1-800-562-6900.